The question everyone seems to be asking today is whether or not intermittent fasting (meaning an occasional fasting period of up to a day not a lengthy fast/cleanse) is a viable weight loss strategy. The answer's rather simple. If a person can happily incorporate fasting of any sort into their lives, and that in turn lowers their weekly available energy intake, then yes, fasting may well be a useful strategy. On the other hand, if fasting challenges your quality of life sufficiently to make the intervention too much to bear long term, well then no, fasting's not for you. As far as fasting goes, there seem to be three primary schools these days. There's Martin Berkhan's Leangains system (the system popularized without credit in The 8 Hour Diet) which at its base involves fasting for roughly 16 hours a day, there's Brad Pilon's Eat. Stop. Eat. 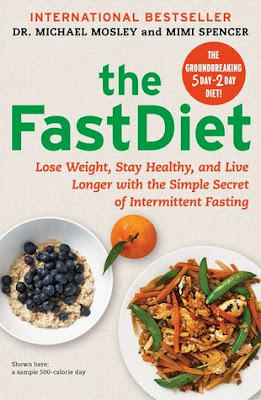 which at its base involves 1 or 2 weekly 24 hour food fasts interspersed with healthful eating, and there's today's featured review of The Fast Diet which takes researcher Krista Varady's work on what she's called alternate day modified fasting (ADMF) and bookifies it for the masses. At its base, ADMF (and The Fast Diet) simply involves ensuring there are two days weekly where calories consumed are in the 500-600 range. "Scientists are only just beginning to discover...". Putting aside the fact that many of our closest primate relatives do in fact graze all day (chimpanzees for instance), I'm not sure this theoretical line of reasoning really matters in lieu of evidence, though certainly it does provide a reason to consider the possibility that fasting has interesting properties. "The scientific evidence was extensive and compelling". Odd that statement in the context of this book given the vast bulk of the book is quite literally built off the personal (and clearly conflicted) anecdotal evidence of Dr. Mosley and Ms. Spencer's own experiences with their diet - one might have thought that were there actually extensive and compelling evidence a medically trained award winning journalist might have preferred to rely on it to tell the story rather than what he ate for breakfast. When The Fast Diet does venture into evidence based research the bulk of it comes from mice and rats - useful models to start with no doubt, but of course results from rodent studies are not automatically translatable into humans. One of the book's primary theories is that fasting is helpful because it reduces circulating levels of IGF-1 (insulin like growth factor 1) which in the case of a particular strain of mouse, might be implicated in many disease processes including aging and cancer. And while I am by no means an expert in intermittent fasting or IGF-1, it strikes me as odd that in the few studies I found on medline that specifically looked at IGF-1 levels and intermittent fasting in human subjects following the ADMF protocol espoused by The Fast Diet, there wasn't a consistent effect on IGF-1. One study I looked at showed a decrease in IGF-1 only when energy restriction was accomplished by means of a 10 week liquid ADMF diet, while the other, actually showed little change or even a small rise in IGF-1 levels following a full 6 month trial of ADMF dieting by overweight women. But rather than report on the effect one of the longest and largest trials of ADMF dieting in overweight humans that showed no change to circulating IGF-1 Dr. Mosley chose to report on his own personal drop in IGF-1 levels while following his diet - an odd thing considering the randomized trial he didn't cite was in fact conducted by Dr. Krista Varady - the researcher responsible for The Fast Diet's actual regimen and one of the book's most regularly featured personalities. Dr. Mosley's self reporting doesn't end there. He also happily self reports that his fasting glucose level went down consequent to his fasting....but of course he also happened to have lost 10% of his body weight - an amount more than sufficient to explain his biochemical improvements, and he reports that his memory seemed to have improved as evidenced by his results in an online test he took twice. Dr. Mosley's section covers other purported benefits of ADMF fasting - most propped up almost entirely by theoretical or non-human based underpinnings with his take being that ADMF fasting staves off Alzheimer's, prevents cancer, improves chemotherapy, lengthens your lifespan, improves your memory, decreases depression, and of course helps you to lose weight and improves your cholesterol. "widely accepted disease-busting, brain-boosting, (and) life-lengthening". "While hunger pangs can be aggressive and disagreeable like a box of sharp knives, in practice they are more fluid and controllable than you think". "While the long-term experience of intermittent fasters in still under investigation, people who have tried it comment on how easily it fits into everyday life". Now whether that's true or simply the effect of post-purchase rationalization it flies some in the face of Dr. Varady's work with ADMF dieters which showed that folks randomized to intermittent fasting ala The Fast Diet's style for 6 months were far less likely than those randomized to more traditional caloric restriction to want to sustain the intervention (58% vs. 85%). "you'll start to choose healthy foods by default, not by design". yet did not provide a reference. And that's rather crucial in a book that relies on personal anecdote rather than published evidence, or at the very least, clinical experience. From what I can gather neither Dr. Mosley nor Ms. Spencer actually work with individuals who struggle with their weights and I don't think it's a given that the experiences of a woman whose starting BMI was 21.4 (or Dr. Mosley's of 26.4) would necessarily be applicable to those who struggle with their weights to begin with. Putting my many objections to the reporting of hope and theory as fact, one thing bothered me throughout. If the putative benefits of fasting stem from evolving during centuries of dietary insecurity why would fasting's benefits be expected of diets that even on "fasting" days provided 1/3-1/4 of most folks' daily calorie requirements? Seems to me if you are convinced by the early evidence, and indeed there is some, that fasting confers some biochemical advantages then you should in fact fast, rather than eat and call it fasting. "studies and experience show that intermittent fasting will regulate the appetite, not make it more extreme"
"It all points to a healthier, leaner, longer old age, fewer doctors' appointments, more energy, greater resistance to disease"
"yet science is only just starting to catch up". So if you want to try fasting as a means to control available energy intake - by all means go for it, but as the authors in rare moments of clarity between wild conjectures and unsupported statements point out, the science is still far too young to be conclusive. Remember, as always, the most important factor to consider when analyzing your diet is whether or not you like your life while you're losing your weight, as whatever weight you lose with an effort you ultimately abandon is almost certainly going to return when you head back to the life you were living before you lost.